The Pilgrims, shown here celebrating their first Thanksgiving, were a group of Puritans who landed at Plymouth Rock, in what is now Massachusetts, United States, in 1620. In 1621 Governor William Bradford of New England proclaimed a day of "thanksgiving" and prayer to celebrate the Pilgrims' first harvest in America. United States President Abraham Lincoln, following the precedent of a number of states, designated a national Thanksgiving Day in 1863. Now Thanksgiving Day falls annually on the fourth Thursday of November. The original Thanksgiving feast was a one-time event that was never intended to be repeated. In 1621 in a colony south of what became Plymouth, Massachusetts, the colonists had just completed their first harvest in their new home with the help of the native population. In the recognition of the help, thanks for a bountiful harvest and mercy for having survived, Governor Bradford called for a feast of celebration that lasted for three days. The menu likely included fish, berries, watercress, lobster, dried fruit, clams, venison, and plums. Fifty-five years later another day of Thanksgiving was proclaimed by the governing council of Charlestown, Massachusetts, for June 29, 1676. This celebration was an expression of thanks for the good fortune that had allowed the community to become securely established. Again, however, this was scheduled as a one-time event. A similar one-time Day of Thanksgiving was proclaimed in October of 1777 to commemorate the patriotic victory over the British at Saratoga. This marked the first time all thirteen colonies joined together in such a celebration. In 1823, Sarah Josepha Hale, the Editor of The Boston Ladies' Magazine, began a forty-year campaign to establish a national day of Thanksgiving. She wrote Governors, Senators, and Presidents. Finally in 1863, President Lincoln decreed that the last Thursday of November would be observed each year as a day of Thanksgiving. Today, Thanksgiving is a day of gathering together friends and family and looking inward. Whether in prayer or meditation, it should be a time of acknowledging that life is good, full and bountiful regardless of your financial situation. We place upon our table what our hands have prepared and share it with others and give thanks that we can. A legal holiday in the U.S., first celebrated in early colonial times in New England. The actual origin, however, is probably the harvest festivals that are traditional in many parts of the world. 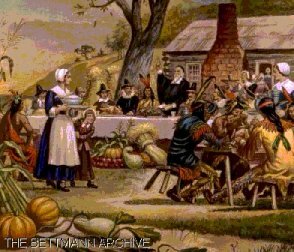 After the first harvest was completed by the Plymouth colonists in 1621, Governor William Bradford proclaimed a day of thanksgiving and prayer, shared by all the colonists and neighboring Native Americans. In 1623 a day of fasting and prayer during a period of drought was changed to one of thanksgiving because the rain came during the prayers. Gradually the custom prevailed in New England of annually celebrating thanksgiving after the harvest. During the American Revolution a yearly day of national thanksgiving was suggested by the Continental Congress. In 1817 New York State adopted Thanksgiving Day as an annual custom, and by the middle of the 19th century many other states had done the same. In 1863 President Abraham Lincoln appointed a day of thanksgiving, and since then each president has issued a Thanksgiving Day proclamation, generally designating the fourth Thursday of November as a holiday. Thanksgiving is a statutory holiday in Canada, celebrated, since 1957, on the second Monday in October. Observance of the day began in 1879. "Thanksgiving Day," Microsoft Encarta 97 Encyclopedia. (c) 1993-1996 Microsoft Corporation. All rights reserved. Who should be invited and should you have a Children's Table? will give you toll free numbers for those cooking questions. Great greeting card site I know you will love! !